By the end of 2014, Bombardier will be starting the production of the Traxx AC3 for DB Schenker. In 2013, a first batch of 110 units was ordered by the German Railways (DB) for its freight operator DB Schenker. It was the first order based on a new framework agreement of up to 450 units. At this moment, Bombardier is delivering TRAXX AC3 locomotives to DB Cargo extra fast. Next to the locomotives part of the regular delivery schedule (now at no. 187 131 REV 26.07.2017) also five 'stock' machines are made ready for DB Cargo: 187 080-084. The first two are already in revenue service, 187 082 completed a test run today. During the last months several TRAXX AC3 electrics have been seen that did have the DB Cargo livery, but not its logos. Examples were the designated 187 080 and 081. It suggests that these machines are built for other potential customers that place small orders and expect short delivery times. But no, today the 187 080 was transported to DB Cargo in Mannheim, now in full DB livery. Deutsche Bahn has 110 TRAXX AC3 locomotives on order. We know now that the 187 080 and 100-128 are part of this order. Brand new 187 116 seen on 16.01.2017 in Heddesheim / Hirschberg. Photo: Valentin Andrei. Yesterday, a 'Lokzug' (a train with only locomotives) was seen around Munich, with several interesting new locomotives, that have not been delivered to a customer yet: Alpha Trains 186 202 + future ELL 193 256 + future Railpool 187 316 + Alpha Trains 186 242 + future DB Cargo 187 103 with Bombardier flex panels. Thanks to Michael Raucheisen. 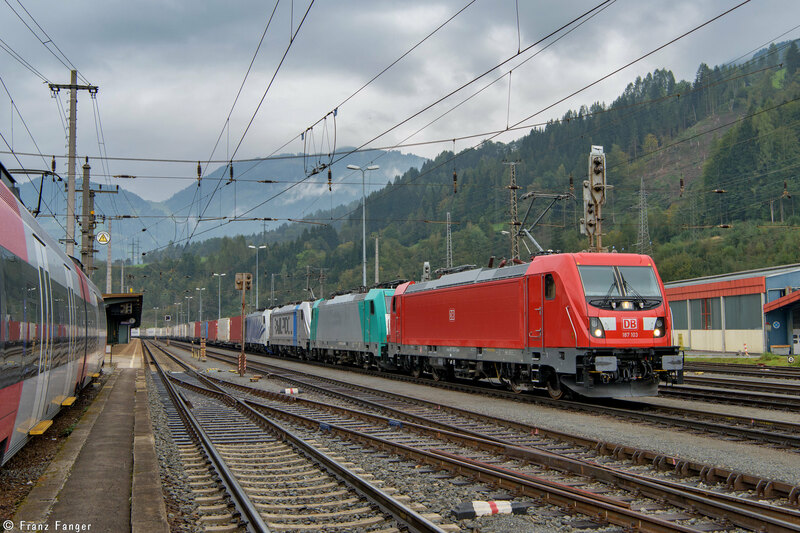 Four locomotives in various liveries on test in Schwarzach-St. Veit: Future DB Cargo 187 103, Alpha Trains 186 242, Railpool 187 305 and Lokomotion 186 442. Still something special, but standard in the future, a DB Cargo 187 series locomotive in the 'working field'. Ralf Lauer was able to catch the 187 114 on 15.09.2016 in Mainz-Bischofsheim. On 06.09.2016, DB Cargo 187 113 left Kassel. The machine ran under its own power to Gremberg, where it will be used for staff training. The machine has revision date 02.09.2016. There is no red 'flex panel' installed, like we saw before on 187 101, 102 and 108. On 07.09.2016, DB Cargo 187 114 (rev 05.09.2016) was next. It will be sent of the Mainz-Bischofsheim. At the same day, DB Cargo 187 115 had its maiden run. The production continues. This morning, DB Cargo's future 187 114 had its maiden run. A picture from Kassel-Oberzwehren. Thank you Marcus. An unusual sight: DB Cargo locomotive 187 106 and double deck coaches. Seen at Hennigsdorfer test tracks and photographed by Norman Gottberg. The production of TRAXX AC3 locomotives for the German railways is gaining momentum. For DB Schenker 187 118 and 119 have been completed. For DB Regio locomotive no.9 will soon be painted and is than ready for assembly. An unique combination, you maybe will never see again. DB Cargo's 189 001 testing with three future colleague locomotives: 187 100, 104 and 105. Norman Gottberg was able to catch this train at the test ring in VUZ Velim in the Czech Republic. Lately, the new TRAXX AC3s for DB Cargo are being tested a lot in combination with other locomotives. We also recorded test runs with 185s for example. You may have read about the current re-organization of the Deutsche Bahn. Together with consultation company McKinsey, it is redefining its services and organizational structure, so it can face the rapidly changing market circumstances. One of the measures taken is the merger of all rail transport services of the Deutsche Bahn into one division now called 'Traffic & Transport'. Railfreight logistics is taken out of the logistics division and will continue under the 'good old' DB Cargo brand name. To the outside world the Traffic & Transport division will brand itself as 'DB' so we don't expect locomotives nor carriages to get DB Cargo logos again. So the DB logo currently in use will stay as it is. Until the end, all international railfreight divisions (for example DB Schenker Rail Polska and DB Schenker Rail Italia) will be renamed as DB Cargo. The non-rail logistic services will continue under the name DB Schenker. Separating the rail related activities from the rest fits the strategy to (partially) sell the new DB Schenker. DB has intentions to do this, but faces strong opposition form the German government. To be continued. For our website, it means we have to rename the owner name of several thousands of locomotives. This will be done in one big batch. We are working on it. Normally, the newest locomotive in a batch gets the highest designated number. Sometimes this does not happen. The newest TRAXX AC3 for DB Schenker that has left the factory at this moment no. 187 100. Remarkable as the DB Schenker batch numbering started with 187 101 in 2014. On 26.02.2016 the machine was parked at Kassel Rangierbahnhof, one day later it was picked up by RailAdventure's 139 series locomotive. The machine went to the VUZ test center in Velim (CZ) for testing. Rail technology leader Bombardier Transportation announced today that its BOMBARDIER TRAXX AC3 Last Mile Locomotive has been homologated in Germany. The locomotive received official approval for operation from the German Railway Authority Eisenbahn-Bundesamt (EBA) on 17.12.2015. Ulrich Jochem, Head of Locomotives, Bombardier Transportation, said, "Approval by the German Railway Authority is a very important milestone for further implementing the TRAXX AC3 Last Mile locomotive in Central Europe. The TRAXX AC3 Last Mile locomotive will make it possible to utilize entirely new logistics concepts." The TRAXX locomotive's Last Mile features an innovative support diesel engine with an accompanying traction battery and a remote control for shunting. Together, these systems enable this electric locomotive to efficiently bridge sections of non-electrified track. This ability is put to great use in places like ports, terminals, depots or factories where a supporting diesel shunting locomotive is often called in to help trains cross the final, non-electrified, track sections known as the "last mile". Efficiently, economically (with one driver only) and environmentally friendly, the TRAXX AC3 Last Mile locomotives use their support diesel engines only when necessary, and are entirely emission-free when operating in traction battery mode while providing full traction performance also in last mile mode. The TRAXX AC3 Last Mile locomotive is also the first locomotive with the Last Mile functionality to receive homologation in Germany. Bombardier has already received over 240 orders for different TRAXX AC3 locomotive variants and the innovative locomotive has also won various certifications in accordance with the applicable TSI (technical specifications for interoperability). Well, one thing is missing, a proper freight train, but this is free shot on the new generation of AC freight locomotives for DB Schenker Rail Deutschland. At this moment, Bombardier has completed 187 101, 102 and 103 which are available for tests. The approval of this new type (top speed 140 kph, no Last Mile feature, approval for Germany) is pending. 110 pieces are on order for freight transport right now, most likely a number that will be raised on the future. Bombardier has chosen some interesting rolling stock to execute the latest test runs with DB Schenker's future 187 103. These images show the machine with two rakes of coaches belonging to Railroad Development Corporation (RDC) Deutschland. These are former 4010 series coaches that were once property of the Austrian railways. They were refurbished for RDC's Hamburg-Köln-Express (HKX) but are now available for other purposes. The approval process of this new type of locomotives for DB Schenker (Traxx AC3) is currently one of the major projects of Bombardier. Extra: Also DB Schenker's 187 103 has been seen in transport lately. For the first time, a DB Schenker AC3 locomotive has left the assembly factory in Kassel. Behind Railpool > Metrans 186 275 it was taken to the Czech Republic, to the VUZ Velim test center. There it arrived together with test coaches and two Railadventure braking/coupling carriages. There has been some discussion about the ribbed sides of the locomotive. To us, these side walls is identical to the constrcution of the walls of the 187.0 series 'Last Mile' locomotives. The only difference is that the 'Flexpanel' construction is not there yet, including the covers of the frame. The German railways (DB) have put their money on the latest generation of Traxx locomotives for their fleet renewal program. A framework agreement has been signed with manufacturer Bombardier for up to 450 new locomotives. Bombardier is currently building the first representatives of the new Traxx family of the DB. For sure they will be starring at the next Innotrans railway fair. Both DB Schenker (freight services, 110 units ordered) and DB Regio (regional transport, 20 units ordered) will get this new machines. These machines will be the designated 187 and 147 series respectively. The complete press statement here. Today, Bombardier officially announced a new order for Traxx locomotives. It is part of the already announced frame work agreement with the German railways for up to 450 new units, to be delivered between 2015 and 2023. The DB still had to approve this plan internally, what has been done in the mean time.